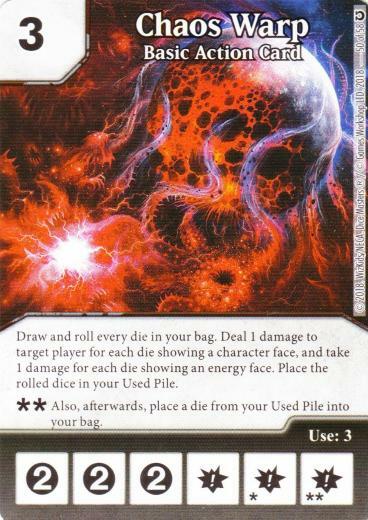 Chaos Warp is one of the new Basic Action Cards from the Warhammer 40K Campaign Box. It has one of those abilities that, at first glance, you think could be good. The big trick with this one is “how?”. This card is “Dice Masters” at its finest. You roll a die and either something good happens (you damage your Opponent) or something bad happens (you damage yourself). Pure random chaos. It is almost the perfect card for a dice rolling game. But, how do you make something so random into a win condition? This has been one of the recent discussions in the Dice Masters Online Community. We all see something, but can’t quite put our fingers on it. In addition to the randomness of the damage, you have to manage your bag in a completely different way. For this to work, there always needs to be multiple dice in your bag. The obvious addition to a Team with this would be the Rare Bishop from X-Men First Class. He would make this a little more one sided in the damage department, buy stopping all of the damage to you, yet still allowing your Opponent to take a hit when the dice hit right. That was all well and good, but I wanted some more consistency with this Team. The light bulb did not go off until I was watching the most recent live stream of the Weekly Dice Arena (side note: check it out if you have not done so). I watched Jo Vega (from CR Gameroom) use Chaos Warp and it completely backfired and hit him in the face for 4 or 5 damage (I believe). It was right then that I realized how this Team needed to be played. The Team: Enter the Warp Zone. The centrepiece is obvious here. I win or lose by Chaos Warp. As cycling the action dice could be a little tricky, I went with the most consistent way to roll a BAC with a double burst ability. Morph takes the rolling of Chaos Warp out of the equation. Simply attack with him and it happens. It also takes a little of the Bag Management challenge out of the equation as I no longer need to cycle Chaos Warp itself. 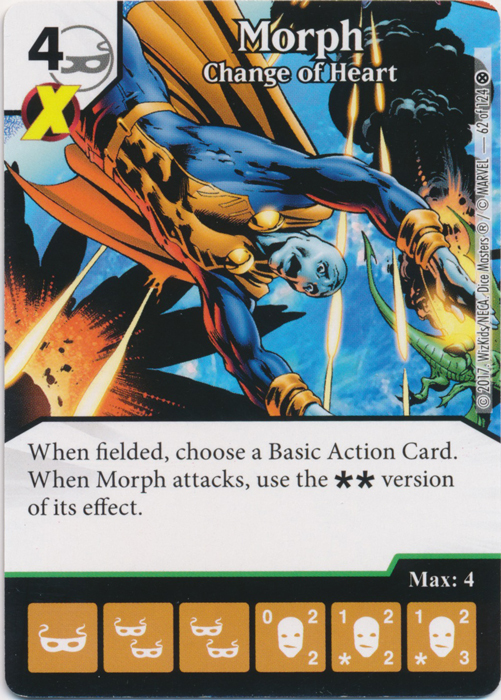 Sprinkle in a little Bishtraction and Morph can stay in the Field to activate Chaos Warp on an “as needed” basis. Now I had the engine to make Chaos Warp activate fairly consistently. I just needed the tool to help it work for me. Like I mentioned earlier, Jo was my inspiration here. Chaos Warp is essentially a different version of a Vicious Struggle Team. I want to get hit in the face and needed to bounce that damage over to my Opponent. Enter a classic Avenger. Basically, Cap is Vicious Struggle on a character. I needed to go this route, instead of VS itself, as Bag Management was part of my other BAC slot (more on that later). Now when Chaos Warp hit me, it would also hit my Opponent. One for one is not bad. But do you know what is better than that? Two for one. 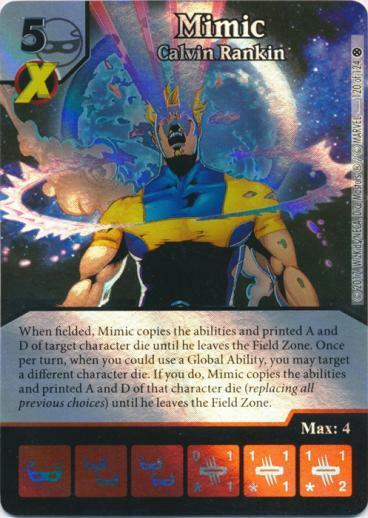 The World Champ himself, Mimic, would become a second Captain America on the Field. Now the damage starts to add up. So, the core is now in place. Morph, Kate Bishop, Mimic, and Captain America are the tools to make Chaos Warp work. Now I needed the accessories. This is an all or nothing Team, so control was thrown out the window. I am worried about my game alone, and don’t really care what my Opponent is doing. It works, or it doesn’t. I put Lex Luthor in as a back-up plan in case I fell too far behind on life before the Chaos Train had a chance to start. He would keep me on life support if needed. Since, multiple 5-cost characters were a key part of the win-con here, I needed ways to purchase them. I chose to skip PXG here, as it would actually mess with my bag on this Team. I went with Atlas for his Fez Global and Kree Captain for his KCG discount. Now my 5 costs essentially become 4 costs which is a little easier to swallow. I really only had two slots left and they needed to be ways to manipulate the bag somewhat. Create Food and Water has the best Global for that, so it instantly became my second BAC. The other slot went to the UC Darkseid for his Global. Hopefully, these would be enough to help ensure something was always in the bag when the combo hit. Now, to be fair, we had a small turn-out tonight (only 3 of us were able to play this week). This Team did not really get a full trial, but I will share what I did manage to get out of it. Against a Bat Family “Team”. I put Team in quotes as it was really just Bat Cards that he had lying together that he decided to play with. He only really bought the Rare Nightwing to clear things out for unblocked damage. He did bring Villainous Pact and Resurrection as well. I pulled off the amazing first turn VP, Rez, and Fez to try and buy my big stuff early. I managed to get set up, but the Nightwings were flying. Once I did get set up, I managed to burn him down to 7 life. However, the Flying Graysons were too fast and eventually he beat me down. I was up against a clever Call Out/Overcrush build. This time, my ramp options were not as plentiful as before. However, after paying full price for Captain America, I managed to roll for KCG on subsequent turns and get both Morph and Mimic for a discounted price. I was ahead on life after I poked a few Sidekicks through so I went full out on the Chaos Warp. With all of the pieces in place, it was surprisingly effective in burning him down. It did help that he had some bad rolls and never really got his combo set up either. .500 on the night doesn’t really say much. However, I think that this is how Chaos Warp needs to work. You have to be willing to use your life as a resource and burn yourself in order to win with it. 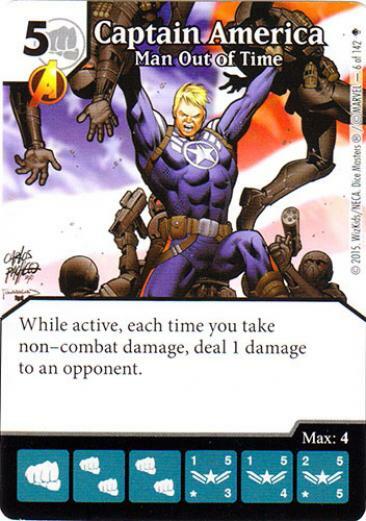 Using Mimic with Captain America makes a world of difference here and probably makes this fairly viable. Lex was not purchased at all, but I would be tempted to leave him on the Team for the security blanket aspect. Kree Captain is good, and I think the discount helps. However, I might be tempted to try out a cheap swarmer as an alternative in this slot. I can always stop the Swarm when needed later in the game. Atlas would fall into the above situation. He was nice to have, but I am curious if some other options would suit this slot better. Darkseid… He really did not come into play at all. The Cake Global was just better overall. I would swap him out for something else in the next build. I really want to try this Team again with something like Xavier’s School to continually empty my Bag. I think that could make this even better. I really enjoyed playing this Team, but it absolutely needs some more testing to refine it. I definitely plan on playing it again… but probably not next week as there were threats of Bishop showing up when I mentioned wanting to play it again. Have you figured out a good way to use Chaos Warp yet? What did you do with the build? What changes would you make to this Team to make it more efficient? Very interesting team. I think the new Atlantis would definitely work better. You could send all of your sidekicks to the Used Pile and guarantee that you have characters in your bag to get the odds of rolling characters better. Also, what the devil is Fez referring to? Is it a way to say Fist Resurrection instead? Definitely Atlantis could be helpful. It needs some way to get things from your bag. With this build though, you want the energy face as it is more damaging to your Opponent. If you were trying to avoid it, Atlantis would be much better. Fez is definitely “Fist Rez”.